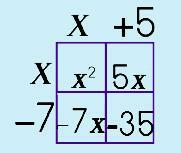 One of the easiest methods to help in factoring quadratic equations or in multiplying polynomials is a method that uses a lattice or 'box.' Once you've learned how to use this method, you may never want to go to any other method like FOIL. Look at your problem. 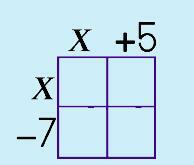 In our problem we have two binomials. 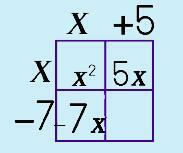 This means we need to make a 2x2 box. Going systematically, starting in the top left corner, begin multiplying! then move to the top right. until I get to the very last box. Now, all you have to do is take what is in the box and simplify! Beginning in the TOP left and moving through each box (by going systematically through the boxes I know I won't make any mistakes! ), begin simplifying. 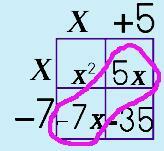 Look at the DIAGONAL (see circled terms in pink). These can be simplified. Here…try a few on your own!